Return to the charming days of riverboats and Mark Twain and discover this moderately priced resort. Courtly pillars, grand staircases and splendid gardens blend with the Mississippi-style waterways and gracious Southern hospitality. “Mosey over” to Alligator Bayou and discover its rustic architecture, front porches and meandering walkways. 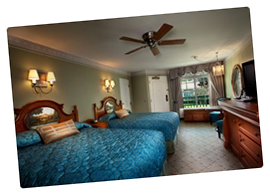 A stocked fishing hole, country-style pool, flowered fields andPort Orleans Resort Riversidetwo-story cottages create the nostalgic romance of down-home charm. On select nights the River Roost host cabaret performer Yehaa Bob with a show you won’t want to miss! 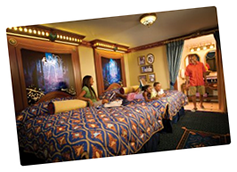 These newly refinished rooms have a royal touch from Princess Tiana and her Disney pals.